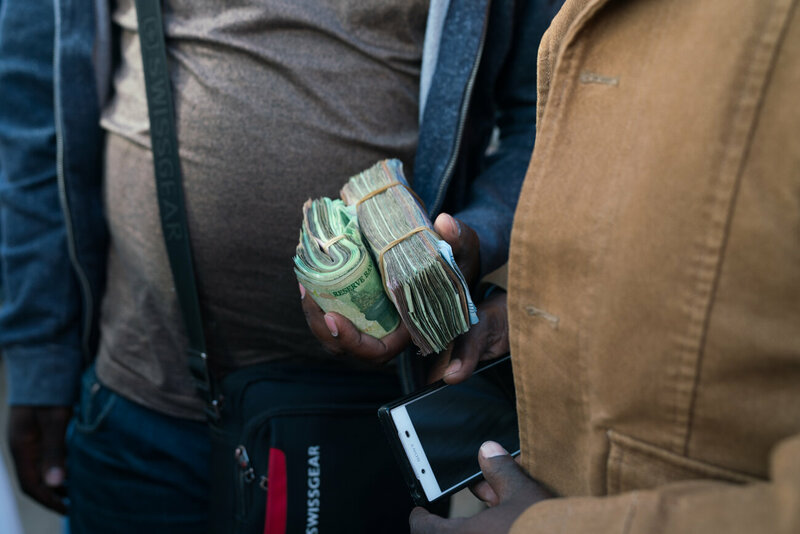 A money trader holds wads of cash on the street in Harare. Moyo is from a small farming town about 65 miles outside of Harare. He says banks in his town usually don’t have any cash at all these days, so he takes a bus into the Zimbabwean capital city twice a week to wait in a line like this. He has to pay for that bus ride in cash, and if the bank runs out before he can get some, he sometimes has to stay overnight until he can try again. 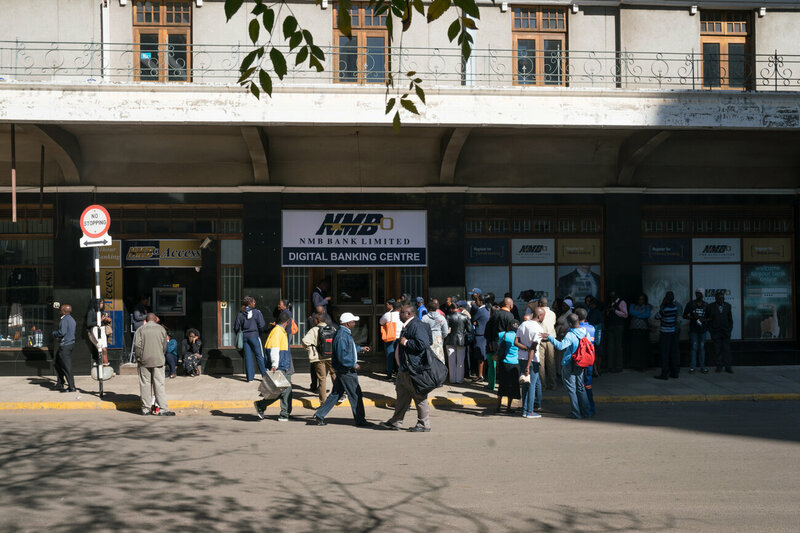 Zimbabweans stand in line in front of NMB bank in Harare. 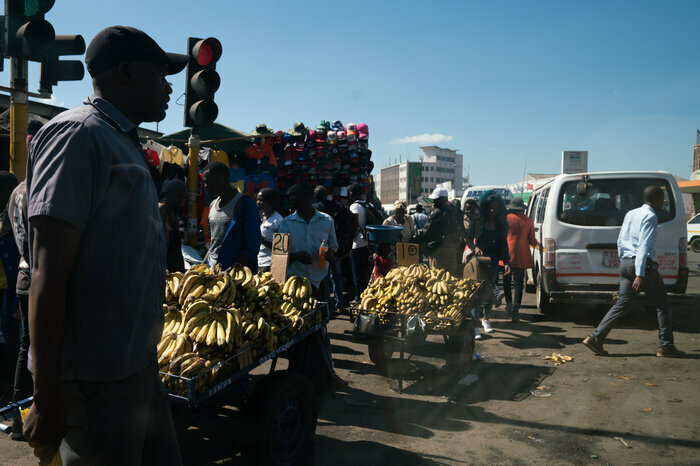 Zimbabwe has been facing a major cash shortage for the past two years, a symptom of the country’s larger and longer economic crisis. Zimbabwe has been facing a major cash shortage for the past two years, a symptom of the country’s larger and longer economic crisis. After Robert Mugabe was ousted from power by the military last November, his replacement, Emmerson Mnangagwa, has claimed that Zimbabwe is now “open for business.” But getting cash into the country is complicated, and access to physical currency hasn’t improved with the leadership change. 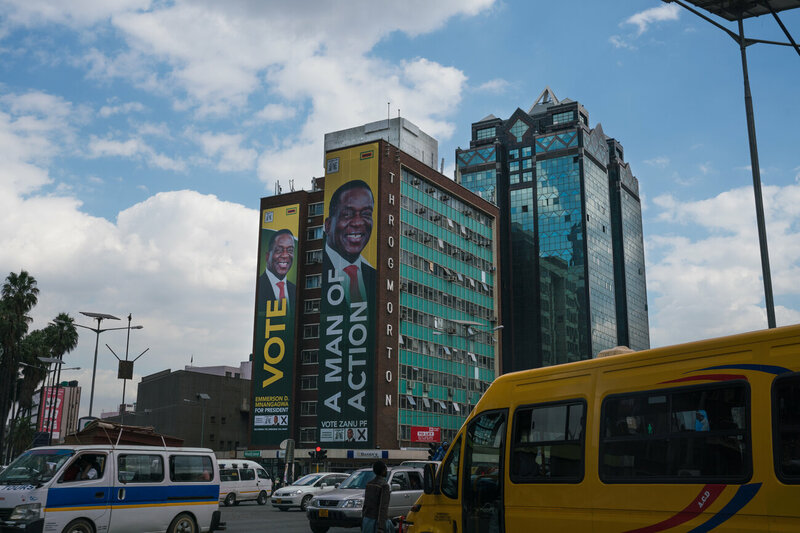 Emmerson Mnangagwa’s campaign poster hangs on the side of a building in downtown Harare. At another bank down the street, Rumbidzai Chihera is also waiting in an ATM line. She sells chickens for a living, but no matter how much she earns, she’s limited to the amount of cash available at the bank. She says her bank used to let her withdraw $100 a week, but in recent months that limit has dropped to $40. 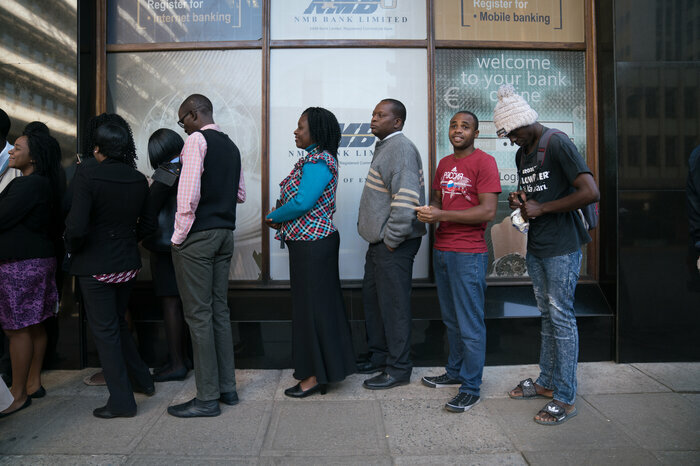 People line up to use an ATM at NMB bank in Harare. The cash problem stems from massive hyperinflation Zimbabwe experienced in the years leading up to 2009. By then, inflation was so bad that the Reserve Bank was printing notes with a valuation of 100 trillion Zimbabwean dollars — reported to be worth about $300 at the time. Zimbabwe eventually abandoned its currency in favor of the U.S. dollar and several other currencies. But as the country slipped into a widening trade deficit and a lack of foreign investment, U.S. dollars became harder and harder to find in the country. So the central bank introduced bills called “bond notes” in 2016, worth $1 each in the country, but worthless outside of Zimbabwe. 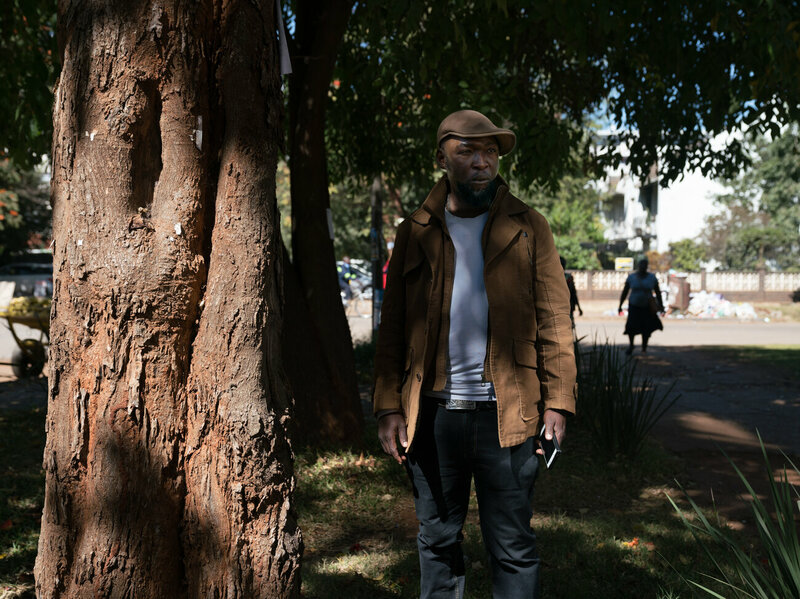 Menashe Runganga, 44, is a money trader — a person who can exchange foreign currency for Zimbabwean bond notes, for a price. Bond notes come out of ATMs and are used in most cash transactions. There’s also a thriving electronic economy, with more than 96 percent of the transactions in the country happening through plastic money or mobile banking systems, according to the Reserve Bank of Zimbabwe. But cash is crucial for buying things like basic goods at markets — where they’re much cheaper — or public transportation. And a recent two-day crash of Zimbabwe’s most popular mobile banking system showed how precarious it can be to rely on electronic payments. A thriving black market has developed around cash as a result. All over downtown Harare, you can find money traders — people who can exchange foreign currency for Zimbabwean bond notes, for a price. In an area of the city called Copacabana, the sidewalks are packed with people selling items of all kinds. In an area of the city called Copacabana, the sidewalks are packed with people selling shoes, cellphone chargers, clothes, wallets. Money traders — men and women — line the streets, sitting on milk cartons and leaning against storefronts, holding thick stacks of cash: U.S. dollars, Zimbabwean bond notes, South African rand, Zambian kwacha. When cars pass by, the money traders run to the windows, waving bills and yelling unofficial exchange rates, competing over each other to give the best deal. A lot of the goods being sold on the street are bought in neighboring countries and then brought back to Zimbabwe to sell for a profit. But the only way to buy anything across the border is with foreign currency — cash — which is where the money traders come in. 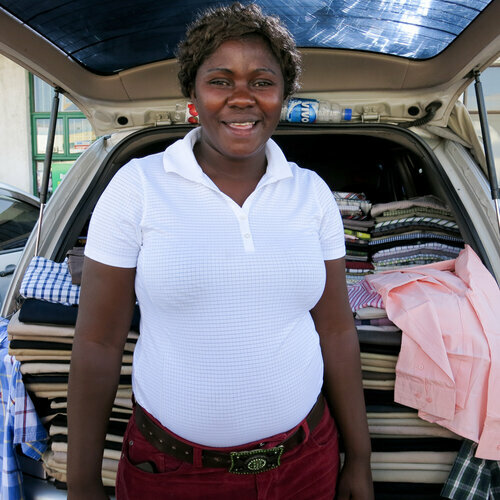 Lawrance Ncube, 32, transports goods across the border between South Africa and Zimbabwe. A lot of the goods being sold on the street are bought in neighboring countries, like South Africa, and then brought to Zimbabwe to sell for a profit. 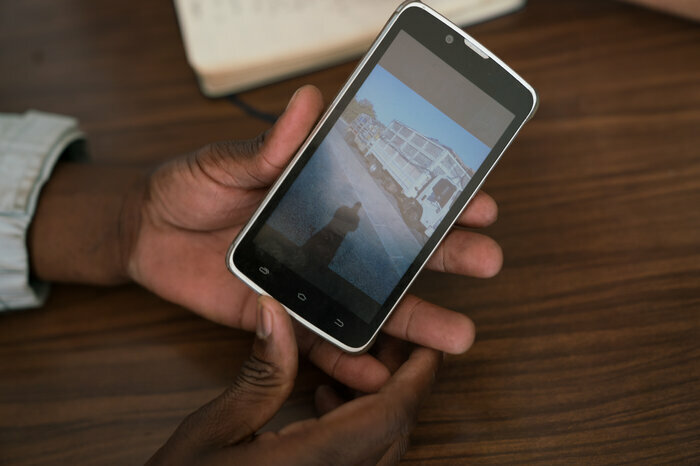 Lawrance Ncube shows a photo of the truck that he uses to transport things across the Zimbabwean border from South Africa. A black sedan pulls up and the passenger window rolls down. A man is sitting inside, ankle-deep in dollar bills — 20s, 50s, 100s. His name is Alec Javial Karim, and he was a banker until 2003, when he quit and started trading money on the black market instead. “The banking system is paralyzed. People are shunning the banks,” he says with a shrug. Alec Javial Karim, 45, ankle-deep in U.S. dollars. Karim was a banker until 2003, when he quit and started trading money on the black market instead. He explains that the cash sitting at his feet all came from people in the diaspora, who send foreign currency home to family members still in Zimbabwe. 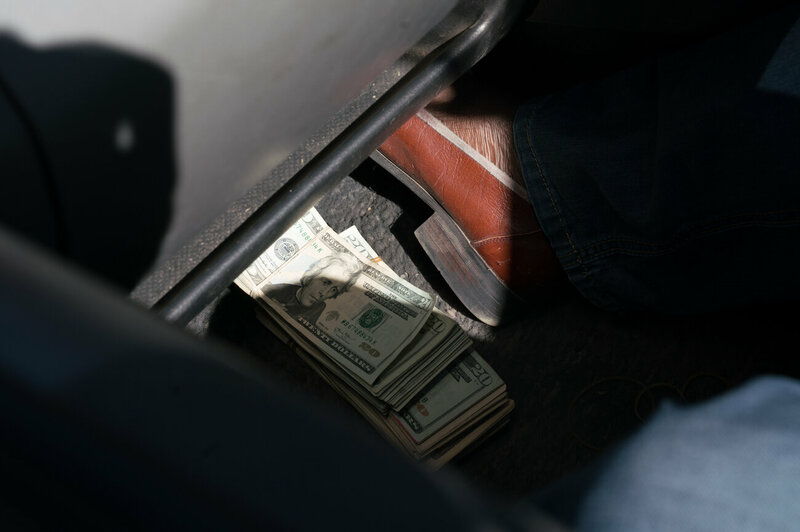 “Everyone has a relative out there — so when they receive [cash], they do not take the money to the bank, they come to the black market where there are lucrative rates,” he says. On the black market, you can get as much a 70 percent more bond notes for U.S. dollars than you would at a bank, where they have to honor the one to one exchange rate. The reason everyone has a relative “out there” is because millions of Zimbabweans have left the country as a result of the economic downturn — jobs are scarce and money is tight. 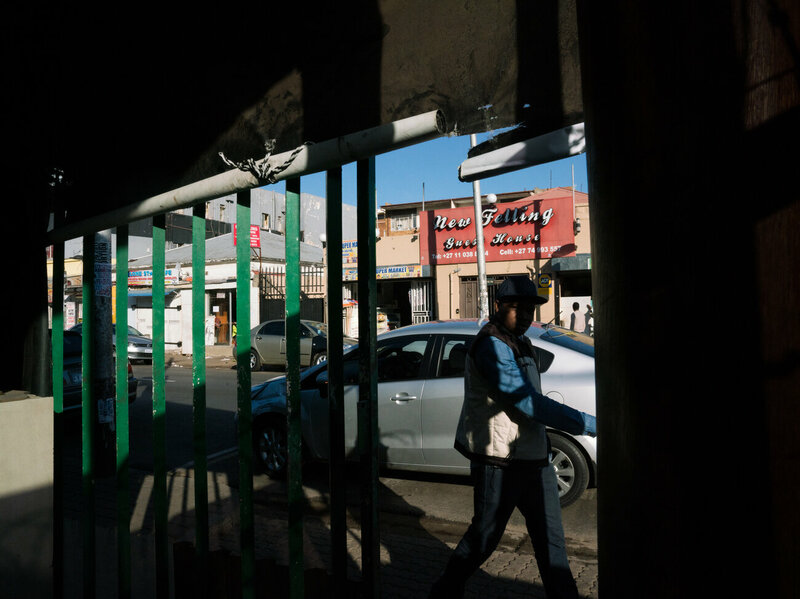 The largest Zimbabwean diaspora community is right across the southern border in South Africa, and in Johannesburg there are whole neighborhoods of Zimbabwean expats. 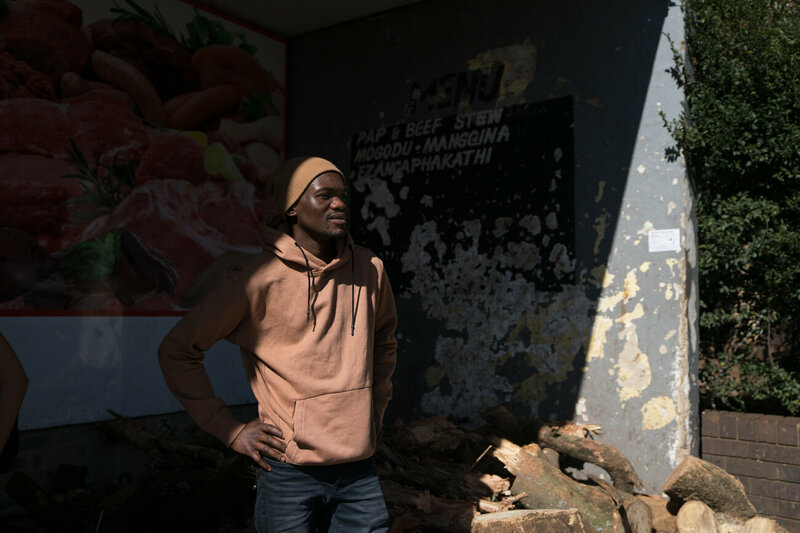 A man walks in front of a restaurant owned by a Zimbabwean expat in Johannesburg. The largest Zimbabwean diaspora community is in South Africa. At a barbecue restaurant in Yeoville, a suburb of Johannesburg, nearly every patron lining the communal tables is from Zimbabwe. Remember Ndebele, 28, is a chef in the city. 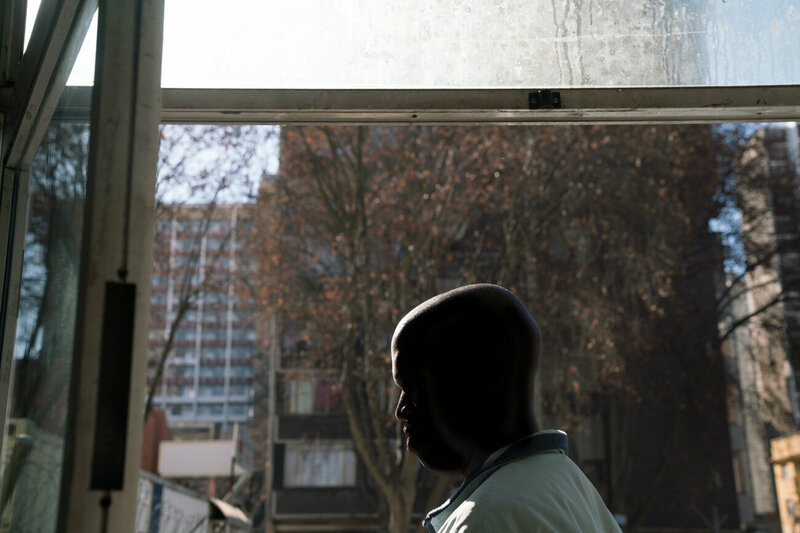 He moved to South Africa nine years ago to support seven family members back home in Zimbabwe. He says he sends about 40 percent of his earnings across the border. Remember Ndebele, 28, is a chef in the city. He moved to South Africa nine years ago to support seven family members back home in Zimbabwe. He says he sends about 40 percent of his earnings across the border.